According to the EPA, the average U.S. office worker goes through 10,000 sheets of copy and printer paper a year. That’s not only a lot of trees; it’s also impacting your bottom line. As the new year approaches, take the time to develop a paper policy for your office. Such a policy will show your commitment to cutting costs, while also remaining an environmentally conscious company. The best way to deal with paper is to eliminate it from the beginning of your business processes. Implementing e-forms and PO Box mailroom services reduces paperwork throughout your office. 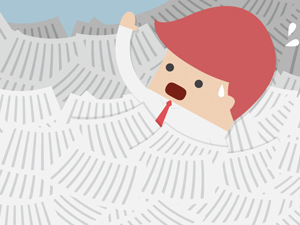 Paper floating around the office can be reduced even further with document scanning services and document management. The added bonus is improved efficiency and lowered costs. Make sure to recycle paper. Buy recycled paper and specify recycled paper for all outside print jobs. Print and copy double-sided to reduce paper waste. When purchasing printers and copiers, be sure to purchase equipment that can print double sided, and them to default to duplexing, when you can. Communicate electronically rather than with paper memos or reports. Email documents and post announcements, forms, and reports on an internal website rather than printing and circulating hard copies. Avoid printing out emails or reports sent to you electronically. Avoid excess printing. When printing informational documents, avoid adding information that will limit the documents’ use, such as the name, date, or location of the event for which it was initially printed. For software to help reduce excess printing, see products and services.